Workshop Plus is now open source! If you're interested in helping develop it, or just getting access to an example of how to integrate with Workshop Framework, head to the Github repo. - See Logs tab > Change Logs for pull patch notes. Any news on an update or fix for the problems we're having at the moment with v104? Seems all the threads with reported bugs have been deleted from the Workshop Plus forum! I rolled back to 1.03 and the problems I was having went away. However, so did my blueprints that I made with 1.04. I get "Blueprint not found in Storage Container"
When I went back to 1.04 I still get the same message. So, my 8 blueprints at this point are gone. Are they in your inventory? If not, then the only hope you have (I guess) is to reload an older save. 7) Build the Blueprint tool. Choose "Create Blueprint" - you should now finally see a list showing ALL your layers - WOOHOO!!!! Congrats, it worked ;). OK, I've checked through my other mods to see if I have a script conflict, nothing. "No script attached to object contains a function Clone_Grabbed"
I get that whether copy and pasting in the command, if I just press the hotkey, or if I have something 'grabbed' and press the hotkey. Edit: a message pops up saying hotkeys are disabled outside of workshop mode even tho I am in workshop mode.. Someone has reported that All Settlements Extended is incompatible, but I haven't confirmed that. Generally folks who have had this problem, it's turned out it was because another mod was overwriting the Workshop Scripts from Workshop Framework. No problems with All Settlements Extended. Do you happen to have a list for those scripts that may get over written? I have a lot of scripts in the folder :/ No idea where to start. I'm dealing with this as well, though I'm not getting the hotkeys notification. I checked if I have All settlements, I do not. Are there other mods, or mod types, which might cause conflict? Would it be settlement item expansions? Would I need to just move this above those in load order, or would I need to disable them entirely? As much as I normally love packing all my mods in BA2 files, maybe if the scripts from this mod where kept loose the overwrite warnings would give people a heads up to a conflict, as it stands now with the scripts in a BA2 file ANY mod that has loose versions of the scripts "wins" the conflict and you'd never even know it was interacting at all unless you looked into each mod you had installed - Main.BA2 file, something most "casual" mod users will not know or have the patience to do. Any solution on your behave @ kinggath?? 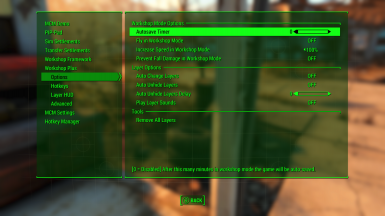 "Hotkeys disabled while outside of workshop mode"
However I am IN workshop mode, which means I can't use the layers or clone anything. Result was Intended Flight when opening workshop and cloning & layers all working as intended. B2A files. BSAs are what they were called in the 32-bit days, and as only 2 games have gone 64-bit (and thus use B2As), the nomenclature tends to be used for either, even though it does cause confusion for new people. i have same problem notting works fore me ??? Oh damit I love that mod! So, this is probably blatantly obvious and I'm missing it anyways, but how do you add objects to a layer? EDIT: Figured it out. Only NEW objects can be added. There doesn't seem to be a way to add things I've already built. I am unable to fly even though i already have it enabled. I also made a toggle for it but it doesn't seem to work. Having the same issue, have you found a fix yet? I have experienced this when wearing a CROSS Jetpack, If you have any mod added accessories you could try unequiping them and see if that helps. @NinthArcher - Nope, I don't use any mod added accessories. I was able to make it work by placing it after sim settlements. However that would make SS stop working. @Brinnmilo - still no solution. I use TCL as a workaround instead. You can comment on my thread here so they know its not an isolated case. First off - Thanks for a great mod! I have encountered a problem and I can't find a solution. 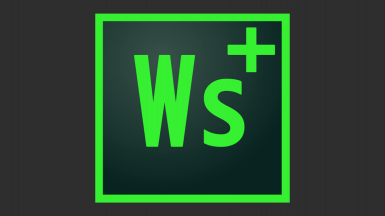 When I try to undo things it says "[WS Plus] Nothing to redo", but I'm not trying to REDO things, I want to UNDO them. If I try to click on the assigned redo-button it says the same thing. I looked thrugh the whole thread, and I have tried to install it manually - it didn't help, tried fast travelling back and forth - didn't help, tried changing load order, uninstalled SimSettlement, but nothing works. What am I doing wrong? I have the same error, plus flight mode sometimes stays after I close workshop even if I wait awhile, its always on, i try to turn it off with the hot key and it doesn't work. Currently experiencing the opposite issue, flight mode has given up on me. I don't run any jet pack mods and have had workshop+ working perfectly since its release. Turns out I can't use the Layer-function either.. Anyone have tips on how to make it work? PS. I have HUD (which does not seem to work though) MCM and Workshop Framework..
Having the same issue. The whole reason I even installed WS+ was because I have scrap everything and keep accidentally scrapping stuff I don't want scrapped. I was hoping adding an undo function would save me from having to restart my save files just because I accidentally deleted a road. Has anyone found a solution for this? Downgrade to 1.0.3! That worked for me. Also, check if any of your mods conflict with WS+, Modular Kitchen did not work for me - but I'm trying to work around that! Hello anyone know is is possible to have the vanilla movement while in workshop mode? I dont like the movement that I get with this mod it feel like if I were floating around I tried disable the fly option in mcm and now I dont fly but I still float ans is hard to move around like this.